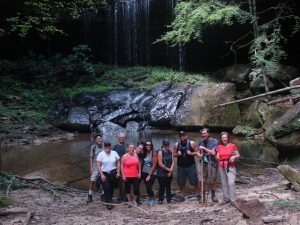 Join Wild South for our next hike in the Bankhead National Forest! This hike is rich in human history as well as natural history. It will begin near the west end of Ridge Road in the northern section of Bankhead National Forest. Ridge Road follows the historical High Town Path, the ancient footpath of Native Americans that went east to west across the south. Stevenson Spring was developed as a park in the 1900’s but there is little evidence now as the forest has reclaimed the land. All that is left are a few stone stair steps and the limestone spring. 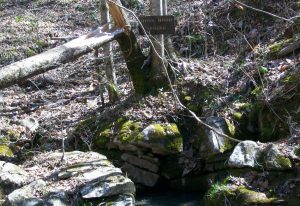 The hike will proceed south through the forest and cross Mattox Creek to Hoss Hood Spring which was the go-to spring back in the day if your own spring went dry. The Boyles family owned land in the hollow and operated a sorghum mill and cooked their syrup near a small twin waterfall. The hike will include the wet-weather waterfall, sorghum mill site and the Boyles’ homeplace site. Expect little elevation change, no trail, rough forest floor. Bring a backpack with lunch, snacks and plenty of drinking water. Wild South hikes are free but donations to support Wild South’s Hikes Program are gratefully accepted! There will be a donation bucket on the picnic table at the Wild South office.